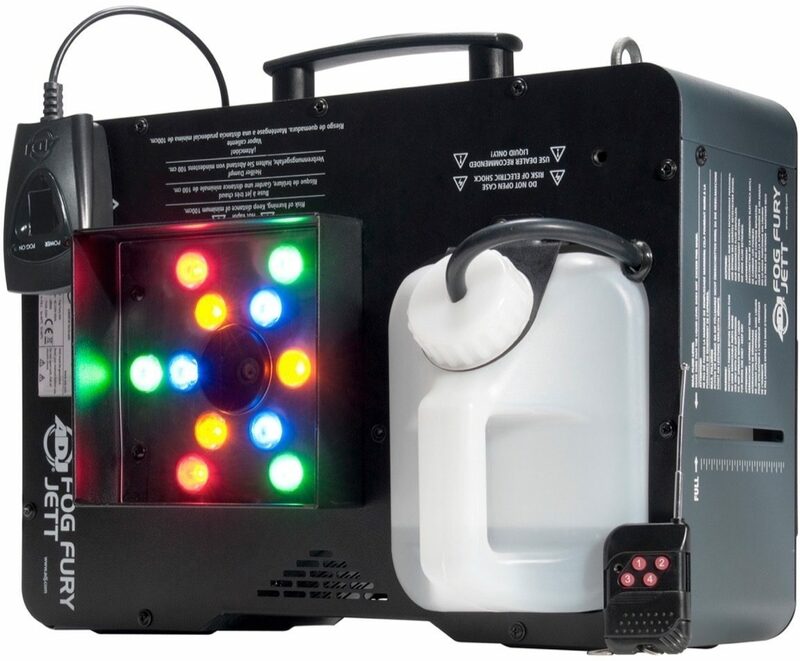 The American DJ Fog Fury Jett is a high velocity vertical Fog Machine that mixes color into the fog from 12x 3-Watt RGBA LEDs. With advances in ADJ's heater technology, the Fog Fury Jett produces a dry even blast of fog over 25 feet (7 meters) in the air. It has a special heating element design that uses an oil type transmission throughout the pipeline to prevent clogging. It is also equipped with a high performance Italian pump system for optimum output. 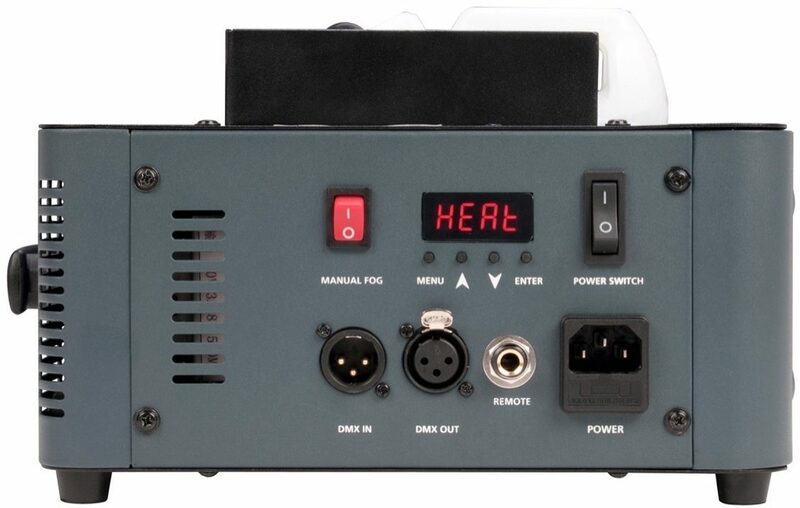 ADJ's Electronic Thermo Sensing (ETS) technology is on-board to maintain optimum heat levels with short warm-up time between fog blasts. 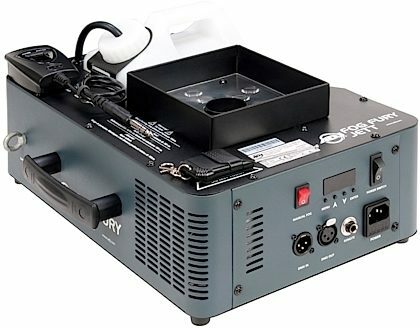 Overall: Awesome fog machine. Throws a TON of fog, very fast. nice colors however you cannot use the colors unless the fog is going, at least not that I've found. The owners manual says you cannot, so I stopped trying. Not the biggest deal unless you are looking for a very specific color at a very specific time (which is why I gave it 4 stars under the features category). Like any other high output fogger, it will have a little noise while you are dispensing fog, but I've found the best solution to that is to turn up the music (the reason for the 4 stars in the sound category). Its pretty quiet when not dispensing a cannon blast of fog. Overall I love this thing. I want another one, just so I can have each side of my set up match....no one will ever see me again if I do this...there is seriously THAT much fog. Videos DO NOT do this thing justice. It looks awesome in videos, but even more amazing live....like pyrotechnics without the heat. Overall: This machine is awesome! Strong output and good colors. Kind of loud when set off due to the amount of pressure to push the fog out, but runs quiet when in the heating stage. Very easy to set up and use. Remote control has 4 options (which I'm told can be customized, but I simply use the preset colors). and has good range. Good size fogger juice tank and doesn't seem to use a lot. Unfortunately, after about 3 nights of usage (about 15 hours of use), it began to go off on it's own without pushing the button and if the button was pushed it would continue spraying even after the button was released. The return was easy - they emailed me a label and as soon as they received confirmation it was on it's way, they shipped a replacement to me. Although a hassle, with the quick turn around time, I shouldn't be without it.